Mixing desks come in many shapes & sizes. They may appear to be quite intimidating at first, with rows & rows of faders & pots, but their functions are basically the same, from a simple 4 channel desk to a large 48 plus channel desk. Question: WHAT DOES A MIXING DESK DO? FROM THE DESK’S OUTPUTS, TO FURTHER PIECES OF AUDIO EQUIPMENT. The mixing desk is the hub of the recording studio & where, more often than not, you will find the sound engineer operating from. Let us consider a very simple set up. We have four musicians playing together. The instruments they have are: an acoustic guitar, a flute, a harp & a bodhrán (this is a hand held drum that is struck with a wooden stick.) They are all fine musicians, but are faced with a number of problems that a sound engineer can help to sort out. When the venue is full, the people close to the stage can hear the music clearly, but those at the back of the room can not hear it so well. Secondly, the instruments all naturally produce different volumes. The acoustic guitar, the flute & the harp all blend quite well from a volume perspective, but the bodhrán is considerably louder. When the bodhrán player starts to play, every one in the band has to play more loudly just to be heard. A mixing desk will help us sort out these difficulties. Let us start with a very simple 4 channel mixing desk & build it as our needs dictate. Looking at the diagram, it is fairly easy to see what is going on. There are 4 channel strips numbered 1 to 4 & each of these are identical. Starting from the top there is a mic input. This is where you would plug a microphone & mic lead. Below this is a fader that you can slide up & down to control the level being fed to the master section. So with all 4 channel faders all the way down, no signal will be passed on to the master section. The volumes your band members produce vary greatly. The signal from the microphone in front of the bodhrán will be considerably greater than the signal being produced by the microphone in front of the acoustic guitar because the bodhrán is a much louder instrument. The mixing desk has to be adjusted so that it can handle all manner of signal levels sent to it. A very loud signal may cause distortion & a very quiet signal will have to be turned up very loud to be heard & this can introduce hiss & buzzes inherent in any audio system. To avoid this you have to set the gain individually for each signal being input into the mixing desk. We would set the gain for all four members of our band, individually & one at a time before we start adjusting anything else. This is the first job that would be carried out in what is called the "sound check. " 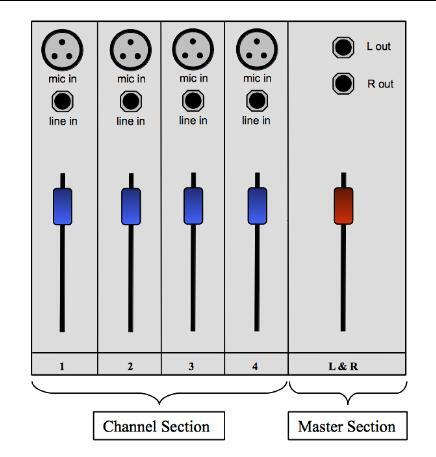 The video below describes how to set the gain for a signal going into a channel on a mixing desk.